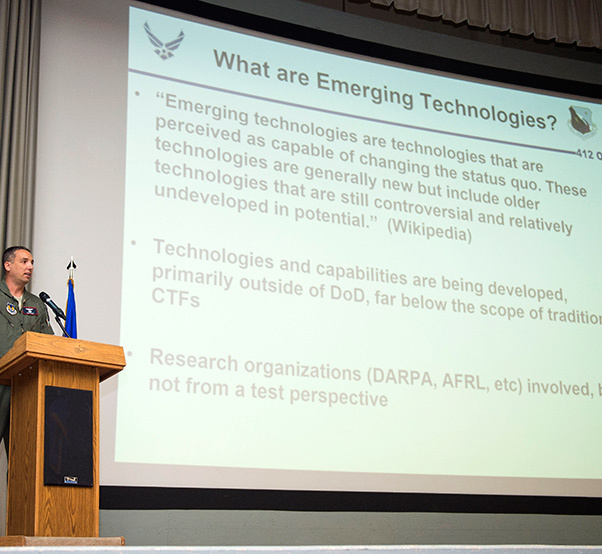 Maj. Dan Riley, Emerging Technologies Combined Test Force director, speaks about the new CTF at a 412th Operations Group commander’s call in the base theater Oct. 3, 2016. The 412th Test Wing at Edwards Air Force Base, Calif., has a new organization that will explore the Air Force warfighting capabilities of tomorrow. The Emerging Technologies Combined Test Force was officially activated in early July and its mission is to provide agile, innovative flight test capabilities for emerging technologies. Riley said that an increasing number of upcoming test programs are below the scope of the current CTFs in the test wing. The existing CTFs are focused on “high-performance, high-dollar-figure items.” The Emerging Technologies CTF is focused more in the thousands-of-dollars-range. Currently, the primary focus for the new CTF is autonomous systems. Riley said these are the big technologies coming in the near future and are in large demand from the Air Force because autonomous systems provide a tactical battlefield advantage and can help reduce manpower requirements. “Our manpower is shrinking, and we already have requirements that are greater than our manpower will allow. Autonomous systems will help us alleviate that problem,” said Riley. However, testing an aircraft that is “self-thinking” and “self-learning” poses challenges. With the recent explosion of relatively inexpensive commercial and military unmanned aircraft systems being used, the new CTF initially will heavily focus on small unmanned aircraft systems. The goal of the new test force is to develop test plans and regulations and to identify areas around Edwards for testing these systems. The CTF works with commercial partners, NASA, Defense Advanced Research Projects Agency, and the Air Force Civil Engineering and Air Force Security Forces centers, who use SUAS in their missions. Recently, the Federal Aviation Administration published rules regarding commercial and civilian use of unmanned aircraft use. The FAA publication grants more access to users, but there are still restrictions. The CTF hopes to create mutual partnerships with commercial SUAS producers so both sides can benefit from testing at Edwards. “We want to learn from what they’re doing because the commercial companies are far ahead of what the DOD is doing. Our focus is bringing the test capability to Edwards and figuring out how to test SUAS. The reason people want to come here is our restricted airspace. We can do things here they can’t do with the FAA. The CTF will oversee safety procedures and planning,” said Riley. The first official test of the CTF is planned for the end of November. The project was brought to the CTF from the base innovation team and will involve a quadcopter fixed with a transmitter to see if the 412th Range Squadron can calibrate their telemetry equipment more efficiently by using a non-fixed antenna that is mobile and above ground, which will be the quadcopter.